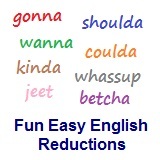 ﻿ Fun Easy English - new-american-english-reductions-reduced-words-topic-word-of-lots-of-lotsa. In this lesson you will learn the American English reduction lotsa. I plan on eating lotsa food at the buffet. I plan on eating lots of food at the buffet. Are you planning on doing lotsa things on your vacation? She likes to read lotsa books. He always wants lotsa sugar in his coffee. Are you planning to get lotsa money? They brought lotsa presents for the kids. The reduction lotsa is used frequently in normal conversation. This is even more common among kids. Reductions, such as lotsa are not real words in English.